From 23-27 June 2014, ASLM leaders co-facilitated two training workshops on mentorship and SLIPTA auditing. 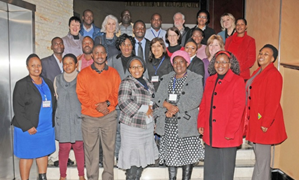 The trainings took place in Windhoek, Namibia and Johannesburg, South Africa, respectively. The Namibia-based workshop, which was jointly facilitated by Clinical and Laboratory Standards Institute (CLSI), focused on mentorship training designed to prepare local laboratoryprofessionals to serve as mentors to other professionals. The workshop convened 20 laboratory personnel to learn about the ISO 15189 standard on medical laboratories, the World Health Organization Regional Office for Africa (WHO-AFRO) Stepwise Laboratory Quality Improvement Process (SLIPTA) checklist, and the attributes of mentorship. The five-day workshop was attended by participants from the National Institute of Pathology, the Namibian Ministry of Health and Social Services and the Centers for Disease Control and Prevention, who received certificates upon completion of the training. 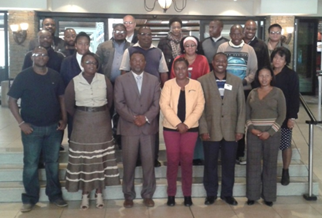 On the same dates, in Johannesburg, ASLM facilitated a WHO-AFRO SLIPTA Auditor Training workshop in collaboration with the National Health Laboratory Services (NHLS) of South Africa. The course material included an overview of the SLIPTA programme, a description of the SLIPTA audit process, review and discussion of the SLIPTA checklist, and completion of a mock laboratory audit using the SLIPTA checklist. Twenty-two participants completed the training, four of whom received their certifications as ASLM SLIPTA Auditors for having completed all certification requirements including field practicums. ASLM and partners continue to demonstrate their commitment to advancing laboratory workforce development through skills training and capacity building exercises. ASLM instructs and certifies training participants in various subjects—including SLIPTA, abstract-writing, grant-writing, mentoring and more—with the goal of ensuring a robust, self-sustaining medical laboratory sector.